Scup lets you upload multiple tracks to your SoundCloud account and create a set on the fly. Please note: Scup's dead. It is not working with the latest SoundCloud API anymore and I don't have time to update it. The source code is still on github though. 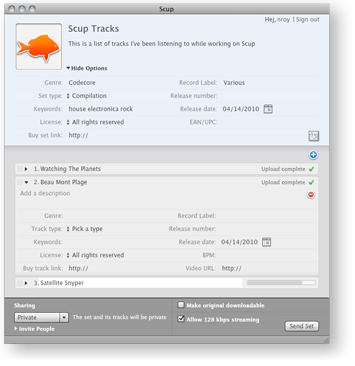 Scup is a desktop app for Mac, Linux and Windows, based on Adobe AIR. Click the badge below to install it. Scup is free. Use it at your own risk. No adware, spyware or other malware included (I hate that stuff as much as you do). Note that Scup will check for updates automatically on startup. Problems using Scup? The incredible guys at SoundCloud put together a great tutorial video. If you encounter any issues, have feature requests or comments, please post on the new feedback forum. Scup was created by Dorian Roy as a demo application for the SoundCloud AS3 API wrapper for Flash and Flex. Read more about Scup and the API wrapper on my developer blog or follow me on Twitter.